The following are the strange crafts and objects I encountered most often over a period of 46 plus years, from 1939 or 1940 until August of 1986…and my family and I a few times since 1986. I will include other stranger craft and objects that were used during the more complex experiences in a later post. As difficult as it might be to believe, I have discovered or have been told that several of the crafts and objects have been a part of our human history (some modern history and some ancient history)…or they have been connected to our modern space program in various ways. I received this information and have verified it with experts to some extent, after my recollections. We often saw them flying or floating in the distorted atmosphere or a blue haze (sometime a luminous haze) several feet above the ground. We also saw them on the ground or near the ground and we interacted with them intimately. Others and I have been inside most of them at one time or another. When we first saw them, they appeared so strange, we normally froze and were most often speechless for a time, etc. ✽ The Windowed Saucer – This was the craft we saw most often. If other objects and craft were present, the voice most often spoke from or near the windowed saucer. At times we saw it in the distorted atmosphere some distance away (most often not more than a mile away) …appearing, disappearing and reappearing ahead of itself, repeatedly for various lengths of time. It flew in a similar unstable manner as you see UFOs fly in recent videos. 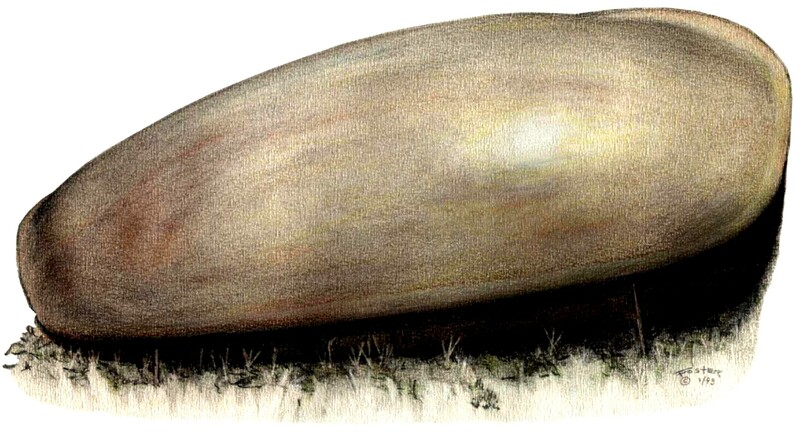 This “flying saucer” (or one identical to it) also was encountered out in “the bush” by a South African tribe. Also, a metallic saucer identical to the windowed saucer (without the windows) apparently is part of a DOD aerospace research program. At times when I first saw the windowed saucer, it was spinning violently. Many other things occurred when we interacted with The Windowed Saucer, as well as the crafts and objects below. ✽ The Coffin-shaped Object – This was one of the strangest objects we encountered. Most often we didn’t see it arrive, but we just turned around and it was there. We touched it at times and a few times our hand would go into it, suggesting that it was just semi-corporal. I have seen a Middle Aged painting of the exact same Coffin, which was identified as one of Ancient Egypt’s “flying boats.” Other abductees also have seen it. ✽ The small discs – These strange mesmerizing craft normally showed up in a flight of four or five. What was most astonishing was that they all had two headlights, like the headlights of a car. And in each light there was a ring that gave the small discs the appearance of having eyeballs. One or more of the small discs also have been seen in Middle Age paintings. And other abductees have told me that they also have encountered the small discs. Some have said the discs scared “the daylights” out of them(…whatever a daylight might be) (humor). 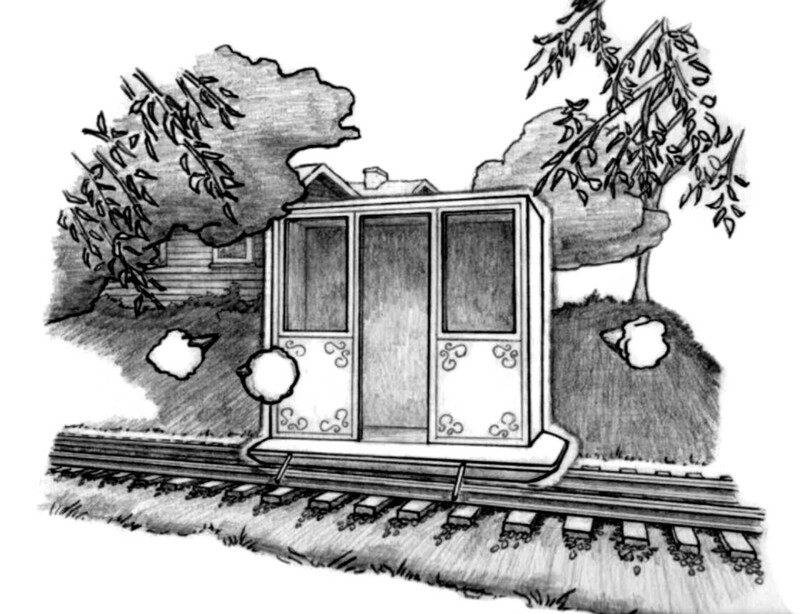 ✽ The small booth – Others and I have seen it flying in distorted atmosphere, with two flashing red lights on it. But we most often encountered it on the ground, after the windowed saucer deposited it on the ground. The voice, speaking in a manner similar to a barker at a circus, would most often encourage all to gather around it and eventually enter it for “eternal knowledge and wisdom” and something to do with “the Indians and buffalo,” etc. Similar booths have been seen in Middle Age paintings. And also, I’ve been told, in more modern times, they have been seen on Indian reservations. Our two daughters recall encountering a small booth or booths during the 1975 Dillon Lake encounter. ✽ The bell-shaped object – Also one of the strangest objects we encountered, the bell was most often near us or sitting on the ground. We saw it several times while playing golf on public golf courses. 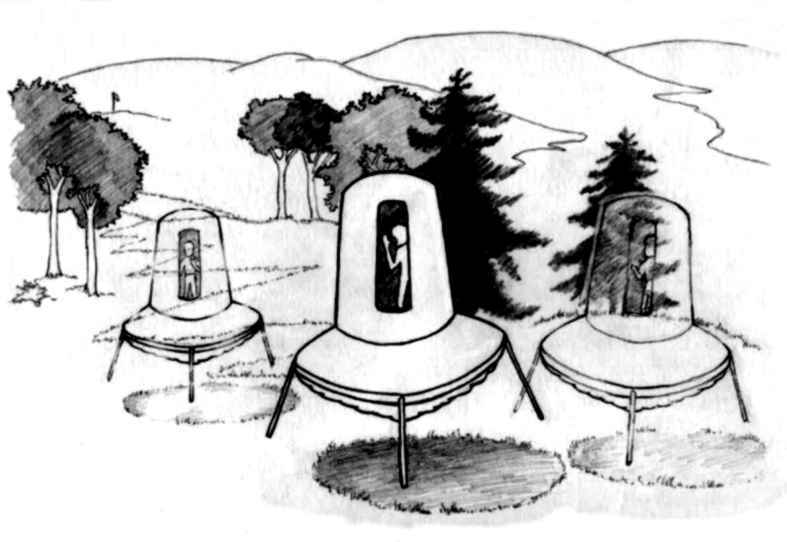 It was shown in the movie “Encounters Of The Third Kind.” It appeared very similar to the capsule used in our United States Mercury Space Program.